At West U Dental Smiles, our team is usually working hard to help patients of all ages keep their healthy, natural teeth. However, there are some cases where removing teeth is actually a better option to keep patients smiling. Third molars, sometimes called wisdom teeth, are the last to erupt into the smile and the most often extracted. 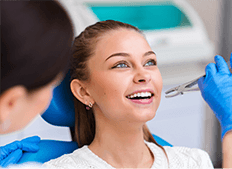 Around the age of 12 or 13, we recommend young people receive a screening to help us determine whether or not wisdom teeth will need to be removed. However, these teeth are not typically extracted until the late teens or early twenties. If you want to learn more about wisdom tooth extractions for Upper Kirby residents, call to schedule a consultation appointment today. We look forward to helping you maintain your healthiest smile. Wisdom teeth are a third set of molars that begin to develop below the gum line around the age of 12 or 13. They typically erupt when patients reach their teens or early twenties. In the past, poor diet and lack of adequate oral hygiene meant that patients were likely to lose one or more teeth by this age, making third molars necessary. Today, adequate hygiene makes wisdom teeth unnecessary for most patients, and the majority of people do not have adequate space for this third set of teeth within their smiles. 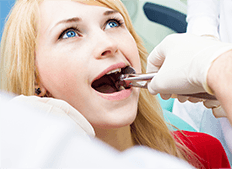 Lack of space can cause a number of oral health issues related to the development and eruption of third molars that may require us to remove the wisdom teeth. 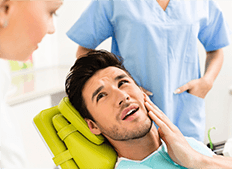 Why do I Need Wisdom Tooth Extraction? Wisdom teeth will either be pulled or surgically removed. Pulling is only possible if teeth are able to fully erupt from the gums. 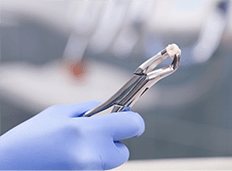 If the wisdom teeth are partially or fully impacted, we will need to surgically remove them. First 48 hours – consume only liquids. Avoid using straws as suction can tug the skin around the extraction site. You should also avoid excessively hot or cold foods and drinks. Take over the counter or prescription medications as necessary to relieve pain. Use ice packs at twenty minute intervals to relieve pain and reduce swelling. First week – begin to consume softer foods like mashed potatoes, Jell-O, and ice cream as you feel able to, but avoid chewing around the extraction site. You should be able to begin reducing the number of over the counter or prescription pain relievers. Monitor your smile for signs of increasing pain or sensitivity. After the first week – you should have any stitches removed as necessary. Begin to introduce more difficult to chew foods back into your diet. You should be able to stop taking pain medications regularly. If you are still experiencing serious pain or sensitivity around the extraction site, you may have an infection or other health concern that requires further care from our team, so please let us know right away.